It sounds like a Sith, perhaps even a hoodless Palpatine, is telling "Kenobi" to "stick to the plan" about four minutes and 55 seconds into the video. The actual quote is "Stick to the plan Kenobi." What's this now? 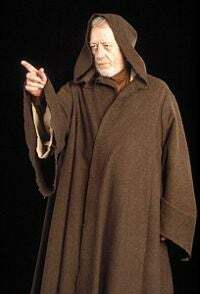 Could it be that LucasArts has approved another storyline that deals with the internal struggle against the darkside, this time featuring Kenobi? I haven't a clue but it does seem to show that the jedi will make some sort of appearance in the game. Whether he's a playable main character or a walk-on appearance remains to be seen. Maybe some of the more devoted fans of Star Wars could pick through the trailer for me and explain, if for no reason other than to let me stop trying to figure it out. Oh, one other thing, it maybe that the last seconds of the video show the platforms the game will be on. Too fuzzy to know for sure, but kind of looks like PS3, PC, Xbox 360 and Wii. Or maybe I'm smoking something. Someone buy Free Radical already and then fill me in.